Vancouver’s must-see attraction, FlyOver Canada, will transform into a magical winter wonderland this Christmas season, from November 27, 2015 to January 5, 2016 at Canada Place. Guests will have fun helping Santa Claus search for his missing elves during the exhilarating flight across Canada, and on to the North Pole. Riders may even be able to catch a whiff of Mrs. Claus’ baking as they swoop over her Gingerbread factory. 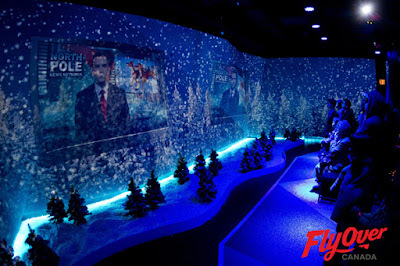 The FlyOver Canada attraction is a flight simulation ride that takes guests on a breathtaking aerial tour over some of Canada’s spectacular landscapes using the latest in ride flight technology. Guests sit suspended 10 to 25 feet above the ground in specialized ride vehicles, with their legs dangling, as they move in concert with the film. With the addition of special effects (scent, mist, wind), riders actually feel like they are flying! December 12, 13, 19, and 21 – 24.
between 12 and 3pm throughout the month of December.